How did Hobbes explain sensation, memory, imagination, thought, and emotion? Hobbes described sensations as effects of movement in the body that are felt through the motions of the heart. Sense always has “some memory adhering to it,” because sense organs retain the movements of external bodies acting on them. So long as the organs are moved by one object, they cannot be moved by another. Imagination is “decaying sense,” after the source of sensation is removed, and memory is similar to imagination, except that it also has a feeling of familiarity. Hobbes believed that thought involved literal movements in the head. His idea of unguided thought led to later theories of the “association of ideas” (that one thought automatically evokes another in the mind). Guided thought is goal-directed. Hobbes thought that while humans and animals both may perform the action that is necessary to reach a goal, only humans have the distinctive trait of prudence. Prudence involves beginning with the action that one can perform and then calculating its consequences as a guide for what to do. Prudence increases with experience. Concerning the passions, or emotions, which he called “endeavors,” Hobbes postulated two types of motion in the body: vital motions, such as breathing, nutrition, and the circulation of the blood; and animal motion, such as voluntary movement. Pleasure is nothing more than motion around the heart. Appetite is an endeavor toward an object associated with pleasure, and aversion is an endeavor away from it. 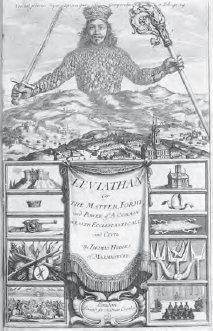 Cover of illustration from Thomas Hobbes’ book Leviathan (Art Archive).